Rangpur is a district in Northern Bangladesh. It is a part of the Rangpur Division. Abdul Hamid Khan Bhashani, shortened as Maulana Bhashani was an Islamic scholar and political leader in British India. His political tenure spanned the British colonial India, Pakistan and Bangladesh periods. The National Awami Party (NAP) was the major progressive political party in East and West Pakistan. It was founded in 1957 in Dhaka, erstwhile East Pakistan, by Abdul Hamid Khan Bhashani and Yar Mohammad Khan, through the merger of various leftist and progressive political groups in Pakistan. Commonly known as the NAP, it was a major opposition party to Pakistani military regimes for much of the late 1950s and mid 1960s. In 1967 the party split into two factions, one in East Pakistan and another in West Pakistan. The assassination of Sheikh Mujibur Rahman was the killing of the president of Bangladesh, Sheikh Mujibur Rahman and almost his entire family. It took place in the early hours of 15 August 1975, when a group of Bangladesh Army personnel went to his residence and killed him, during a coup d'état. 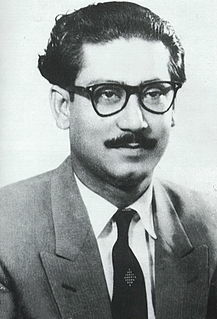 Sheikh Mujibur Rahman ;, shortened as Sheikh Mujib or just Mujib, was a Bangladeshi politician and statesman. He is the founding father of the People's Republic of Bangladesh. He served as the first President of Bangladesh and later as the Prime Minister of Bangladesh from 17 April 1971 until his assassination on 15 August 1975. He is considered to be the driving force behind the independence of Bangladesh. He is popularly dubbed with the title of Bangabandhu by the people of Bangladesh. He became a leading figure in and eventually the leader of the Awami League, founded in 1949 as an East Pakistan-based political party in Pakistan. Mujib is credited as an important figure in efforts to gain political autonomy for East Pakistan and later as the central figure behind the Bangladesh Liberation Movement and the Bangladesh Liberation War in 1971. Thus, he is regarded Jatir Janak or Jatir Pita of Bangladesh. His daughter Sheikh Hasina is the current leader of the Awami League and also the Prime Minister of Bangladesh. The Prime Minister of the People's Republic of Bangladesh is the Head of the Government of Bangladesh. The Prime Minister and the Cabinet are collectively accountable for their policies and actions to the Parliament, to their political party and ultimately to the electorate. Ziaur Rahman, Hilal e Jurat, Bir Uttom was the President of Bangladesh. He was an army officer turned politician who, as a serving major, declared the Independence of Bangladesh on 26 March 1971, and on behalf of Sheikh Mujibur Rahman the following day on 27 March, 1971. He became President of Bangladesh on 21 April 1977. He was assassinated on 30 May 1981 in Chittagong in an army coup d'état. 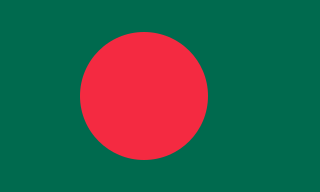 The Bangladesh Nationalist Party is one of the two major contemporary political parties of Bangladesh. It was founded on 1 September 1978 by former Bangladesh President Ziaur Rahman after the Presidential election of 1978, with a view to uniting the people with nationalist ideology of the country. Since then, the BNP won the second, fifth, sixth and eighth national elections and two Presidential elections in 1978 and 1981. The party also holds the record of being the largest opposition in the history of parliamentary elections of the country, with 116 seats in the seventh national election of June 1996. It does not currently have representation in parliament after its boycotting of the 2014 national election. Shawfiqul Ghaani Swapan was a Bangladeshi politician and the former chairman of National Awami Party. During his political career, he served as the Minister of Civil Aviation and Tourism as well as the Minister of Housing and Public Works. Abdul Qasim Mohammad Badruddoza Chowdhury served as the President of Bangladesh from 14 November 2001 until his resignation on 21 June 2002. He was the founding secretary-general of Bangladesh Nationalist Party (BNP). Syed Nazrul Islam was a Bangladeshi politician and a senior leader of the Awami League. During the Bangladesh Liberation War, he was declared as the Vice President of Bangladesh by the Provisional Government. He served as the Acting President in the absence of Sheikh Mujibur Rahman. Shah Azizur Rahman was a Bangladeshi politician who served as the Prime Minister of Bangladesh. However, he was the subject of considerable controversy for his collaboration with the Pakistan Army against the struggle to establish Bangladesh. Moudud Ahmed is a Bangladeshi lawyer and politician. He was the post master general of Bangladesh after independence. Since the eighties he has held numerous political offices for short stints in the Government of Bangladesh, including Deputy Prime Minister, Prime Minister of Bangladesh (1988-1989), Vice President of Bangladesh (1989-1990) and Minister of Law, Justice and Parliamentary Affairs (2001-2006). Abdur Rahman Biswas was a Bangladeshi politician. He was the President of Bangladesh from 1991 to 1996. Biswas represented Pakistan at the United Nations General Assembly prior to the independence of Bangladesh. Mainul Hosein is a Bangladeshi lawyer and the publisher of the daily newspaper The Daily New Nation. He is the former chairman of the editorial board of The Daily Ittefaq, whose building was shelled and completely demolished on 25 March 1971 by Pakistan Army. He served as the law, information and land advisor to the immediate past interim Government of Bangladesh during January 2007 – January 2008. Akbar Hossain was a veteran of the Bangladesh Liberation War, a politician of Bangladesh National Party and a Minister in three Bangladesh governments. The Indemnity Act of Bangladesh was formulated to give immunity from legal action to the persons involved in the assassination of president Sheikh Mujibur Rahman. The assassination took place on August 15, 1975. Lieutenant Colonel Syed Faruque Rahman was the 2IC of 1st Bengal Lancers Regiment of Bangladesh Army He was the chief organiser of the assassination of Sheikh Mujibur Rahman, the founding President of Bangladesh on 15 August 1975. Rahman led a group of junior army officers who overthrew Sheikh Mujib's regime and installed Khondaker Mushtaque Ahmed as president. The Jatiya Samajtantrik Dal is a political party in Bangladesh. The 2004 Dhaka grenade attack took place at an anti-terrorism rally organised by Awami League on Bangabandhu Avenue on 21 August 2004. The attack left 24 dead and more than 300 injured. The attack was carried out at 5.22 PM after Sheikh Hasina the leader of opposition finished addressing a crowd of 20,000 people from the back of a truck. The attacks targeted Awami League president Sheikh Hasina. Hasina was injured in the attack. Hasanul Haq Inu is a Bangladeshi politician and the former Minister of Information of Bangladesh. He leads a faction of the Jatiya Samajtantrik Dal and was involved in a Marxist insurgency in the 1970s. 15 August 1975 Bangladesh coup d'état was a military coup launched by mid ranking army officers in Bangladesh on 15 August 1975. The officers planned to remove the secular government of Sheikh Mujibur Rahman with an Islamic government led by Khandaker Mushtaque Ahmed. Sheikh Mujib and most of his family members were killed in the coup. ↑ "Former deputy prime minister Jamal Uddin Ahmad dies". Bdnews24.com . 4 January 2015. Retrieved 4 January 2015. 1 2 3 "Jadu Mia played pivotal role in transition to democracy after 1975: discussants". New Age. New Age. 13 March 2015. Retrieved 3 July 2016. ↑ Badrul Ahsan, Syed (17 November 2013). "Remembering the Red Moulana" (1). The Daily Star. The Daily Star. Retrieved 3 July 2016. ↑ Ahmed, Rumi (30 May 2011). "Ziaur Rahman: the kind of statesman we need now". bdnews24.com. bdnews24.com. Retrieved 3 July 2016. ↑ "Ex-minister Shafiqul Ghani no more". archive.thedailystar.net. Retrieved 20 January 2017.